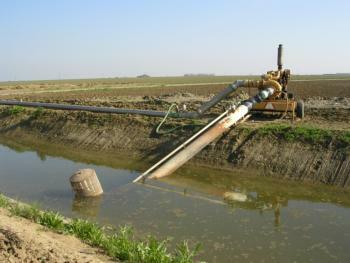 A suction screen filter uses a coarse mesh (sizes range from 10 to 30) for prescreening; it is placed at the inlet of the pump intake pipe where surface water is being pumped. This type of filter should be used where the concentration of organic material suspended in the irrigation water is moderate. A suction screen filtering system uses rotating water jets inside the screen for self-cleaning. Pressure for the jets is supplied by the discharge side of the pump, and flowing water is needed to remove the trash that is jetted off the screen.